This Japanese design book presents the arts, aesthetics and culture of Japan with over 160 stunning color photos and extensive historical and cultural commentary. The Japanese sensibility often possesses an intuitive, emotional appeal, whether it's a silk kimono, a carefully raked garden path, an architectural marvel, a teapot, or a contemporary work of art. This allure has come to permeate the entire culture of Japan--it is manifest in the most mundane utensil and snack food packaging, as well as in Japanese architecture and fine art. 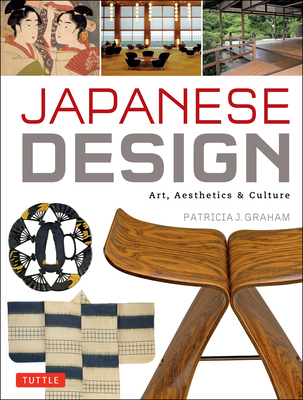 In Japanese Design, Asian art expert and author Patricia J. Graham explains how Japanese aesthetics based on fine craftsmanship and simplicity developed. Her unusual, full-color presentation reveals this design aesthetic in an absorbing way. Focusing on ten elements of Japanese design, Graham explores how visual qualities, the cultural parameters and the Japanese religious traditions of Buddhism and Shinto have impacted the appearance of its arts. Japanese Design is a handbook for the millions of us who have felt the special allure of Japanese art, culture and crafts. Art and design fans and professionals have been clamoring for this--a book that fills the need for an intelligent, culture-rich overview of what Japanese design is and means.